My name is David Dellanave and just a few years ago I was a pretty average lifter. My deadlift numbers were stuck and didn't seem to be going up at all. I tried low-volume programs where I only focused on high intensities and heavy loads – but my max never went up. I kept deloading to improve my form, but no matter how perfect my technique got, my deadlift didn’t improve and I wasn’t putting on any muscle working with baby weights! I tried Westside Barbell's world-famous system, to no avail. I tried high-volume programs with tons of sets. All I got from this was a weakened immune system, getting sick all the time! I even tried a famous program from a well-known Russian coach that did nothing but drive me into the ground with no progress to show for it. But no matter what I tried, I would always just end up injured and in the same place that I was before. I always thought I was making a little bit of progress, but then I would end up "tweaking" something and my progress was immediately STOPPED. I spent a good deal of time chasing a double bodyweight deadlift, but when I finally got it, I got something else I wasn’t exactly going for-a nasty groin injury. This injury left me sidelined from not only deadlifts, but a host of other exercises, as well. As you can imagine, it was quite frustrating, and I gave up deadlifting for a long time. It wasn’t until lifting with David did I consider letting the deadlift back into my life. After introducing me to Biofeedback Testing, David suggested I switch from conventional to sumo, and although I was dubious, I eventually acquiesced. He adjusted my stance and gave me some pointers before sending me off to load the bar. The result? A 10-pound deadlift PR in one day, after not deadlifting for about 6 months. I’ve since gone on to add 35 more pounds to my deadlift with no injuries, all thanks to Dave and his deadlift wisdom! Several years ago, after buying and following a 90-day exercise program, I was left with significant shoulder pain that made it difficult for me to raise one of my arms over my head. Since I am a surgeon, I could not continue with this or any exercise regimen that had a significant chance for injury. 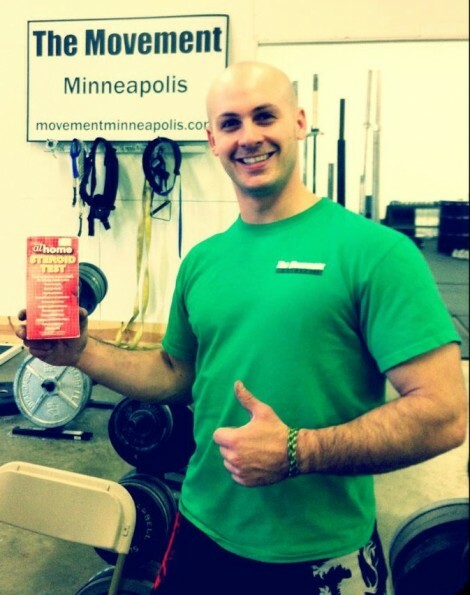 I learned the biofeedback techniques and followed David Dellanave's instruction and guidance, and began deadlifting. The first time I ever did a deadlift in my life was in October 2010, when I was almost 41 years old. I was deadlifting 135 pounds, and it was not pretty. I have continued to benefit from David's guidance, and about four years later at the age of 44, I have a PR deadlift of 475 pounds. More importantly, I have not suffered any injuries. My goal is to deadlift more than 500 pounds, and with David's program I am confident I will reach that goal, injury free. David Dellanave is a world-class guy and trainer who personally took me under his wing and helped me tremendously. I don't think I was sore once, I looked forward to the workouts immensely, and I noticed a huge difference in the way that I felt. My deadlift went from 280 pounds to 430 pounds (at 185 bodyweight) in less then two months. I went from doing a few full pull-ups to 18 strict pull-ups. I learned the hang clean and went from 135 to 205. At the time, Biofeedback Training sounded great in theory, but I was still skeptical. I wouldn't have believed it myself if I hadn’t taken the plunge and tried it. And, as I mentioned, I wasn’t the only one making such remarkable progress, my clients - regular joes and janes - were too. Now, John’s no fitness slouch. He’s a best-selling author, a veteran of the fitness industry for over a decade and one of the biggest names in fitness right now. But, like anyone else, he's human. Even fitness experts hit a rut — which is what happened to John. Not only had he hit a strength plateau, he'd been experiencing extreme pain in his low back. As a result, he'd basically given up deadlifts! Because he's my friend, I really wanted to help. Although I normally keep the recipe for my Secret Sauce close to the vest, I suggested he try some Biofeedback Training. When I explained it, he probably thought I was crazy...but he was desperate and willing to try anything. I coached him through the process, first testing his range of motion, then making adjustments and re-testing him. How the common mantra of "core training" is costing you pounds and risking your back health. What type of deadlift will widen your back, blow up your traps, and give you erectors like tree trunks. Not doing these lesser-known variations is easily costing you 25 to 50 pounds on your best deadlift. The truth about lifting straps – and it’s probably not what you expect it to be. Deadlifting for high volumes – the piece you’re missing. The one cheap thing you should add to your gym bag to nearly instantly give you jacked forearms. The deadlift variation you least expect is the one most likely to help your back pain. The weird-looking deadlift that might be exactly what you need to unlock greater strength. The key to perfect form that multiple world champion and freak of nature Dimitry Klokov knows, and you think is wrong. Why you must change your form when you progress from beginner to a more advanced deadlifter. How to deadlift more often – and put on more muscle – than you ever thought possible. Biofeedback Training 101: Everything you need to know to start implementing Biofeedback Training for yourself. You’re going to learn how to use the most advanced piece of training technology on the planet to tell you how to train smarter. Hint: it’s not a Tendo, an OmegaWave, or an iPhone with a gadget attached to it. Deadlift Training Guide: Lessons I’ve learned on my quest to become a human crane – and coaching hundreds of people along the way. Deadlift Exercise Library: Every critical deadlift variation you need to know. Think the deadlift is as simple as conventional or Romanian? Think again. These variants of the deadlift are the key to unlocking faster gains and unlimited progress. The Off The Floor Program: I’m going to be honest, in the end I want you to use Biofeedback Training to become the master of your own programming, but before you’re ready to do that you need a stopgap. The Off The Floor program is going to outline exactly how to implement all the concepts I lay out in the book for maximum results. Accessory Exercise Library: I would sign up for a program that involved nothing but deadlifting, but unfortunately you’d be shortchanging your results. 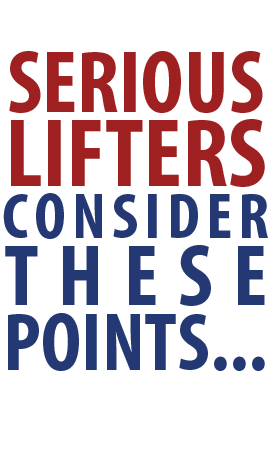 Carefully chosen accessory lifts will round out your strength and speed up your deadlift progress. Special Topics Section: Want to know how to destroy the competition at your first (or next) meet? Have a nagging weak spot in your pull? Curious about the core controversy? This section will finally answer these questions for you once and for all. When I finished writing it, there was so much information that covered so many topics I knew I needed help making it more cohesive. In other words, I needed an editor – badly. Lucky for me, I happen to be marrying Ms. Jen Sinkler, one of the most badass fitness editors in the world. Upon reading it, she remarked, “You wrote fifty-freaking-three single-spaced, 12-point-font Word document pages about deadlifting. You’re insane.” "Insane" may be too strong a word, but it’s certainly not the worst thing I’ve been called. So, I took it as a compliment. The fact is, I simply love deadlifting, and I poured everything I have into the program. Jen was kind enough to edit it for me, and the final product is a tightly edited, beautifully photographed manual full of high-level information – a manual that you can download instantly right now. Steve Pulcinella, Iron Sport Gym David Dellanave has written the most comprehensive book on pulling that you could imagine. If you are looking for more options for pulling a bar off of the floor rather than the traditional ways look no more. Every possible deadlift variation is covered here in this well-written and easy-to-understand book. Expertly written by a real deadlift specialist, Off The Floor has something to teach everyone from beginners to the most seasoned competitor. Chad Wesley Smith, Head Juggernaut In Off The Floor, David Dellanave presents a comprehensive look at developing deadlift strength beyond the normal scope of the 1RM. Many strength coaches and lifters argue that the deadlift is the ultimate test of strength and in the book, David sets out to help you dominate this test in all of its variations (different stances, bars, start heights, rep ranges). This books has tons of great info on all aspects of training for a big pull, from technique to exercise selection, programming to mindset. Definitely check out Off The Floor if you are looking to improve your deadlift as a powerlifter, strongman, athlete, or just someone who wants to dominate the ultimate test of strength. Maya Winters, National Champion Strongwoman & Critically Acclaimed Artist Possessing a proficiency in movement and the physicality of progression, DDN is a true Deadlift pundit. This sagacious observation of the deadlift — the most romantic lift that exists — will, I predict, radiate inspiration through the strength-training community. Off the Floor is thoroughly informative and circulates through every system of which the deadlift is comprised. "Less Than A Session With a Run-of-the-Mill Trainer"
If you wanted to hire me for one-on-one deadlift coaching or you were to come to my gym for personal training, you’d be looking at spending over $200 per hour, easily. While I certainly think that’s a great price for a valuable service, it’s not the expense that keeps my service out of reach for many people. The larger factor is that I can only coach so many people in a day, and I haven’t been able to take on a new client in months. While I love training my clients here in Minnesota, I wanted to make my knowledge available to people all over the world. The Off The Floor manual with almost a hundred pages of content that readers have called "the most they've learned about the deadlift in one sitting" and "flew threw it in one sitting because it flowed so well." Be warned though, you're going to want to immediately go to the gym or garage and train when you start reading. Three completely biofeedback-based training programs to get you stronger no matter where you're starting from. Two 8-week beginner and intermediate programs as well as a 12-week advanced program. This in addition to the original Off The Floor program. Each program is fully biofeedback dependent so in a sense you have an almost unlimited program because no two people will ever do the same program. Nearly an hour of video content on the biggest and most important deadlift variations that will ensure you're getting the most out of your lifting - PLUS a detailed walk-through where I take someone through a biofeedback testing and training session so you can see just exactly how to implement biofeedback in your own training. Test your mettle or build a powerful grip with this bonus guide of grip challenges. Complete these and you'll build forearms that would make Popeye jealous and Olive Oyl swoon. The cold hard facts about every deadlift variation you need to know. Descriptions, instructions, and pictures so that you can have a quick reference with you anywhere, even in the gym. You can certainly deadlift with just the rusty old weight set you found in your parents' basement — that’s part of what makes it so great. But, you’d be missing out on some better training options available to you with the right gear. In this guide I’ll show you tools of the trade, whether it be advanced options, such as bands and chains, or simple things you can add to your gear bag to improve your results. Earlier this year, I created a 9-week Biofeedback Training course. This information was only available to my exclusive subscribers, until now. In this course, I hold your hand and walk you step-by-step through transitioning to a Biofeedback Training system. This has never before been available all in one place, except to my private coaching clients, and I’m going to include it here for free. There are a lot of crap supplements you can waste your money on. There are also supplements that can significantly improve your results with little added cost. Knowing which are worth it is the difference between flushing money down the drain and seeing the difference every time you look in the mirror. I spent over an hour talking to whom many consider the foremost expert on the biomechanics of the glutes and hip – pretty much the deadlift. Bret and I share what we each believe to be the biggest limiting factor in the deadlift, and how to optimize your training to eliminate it. 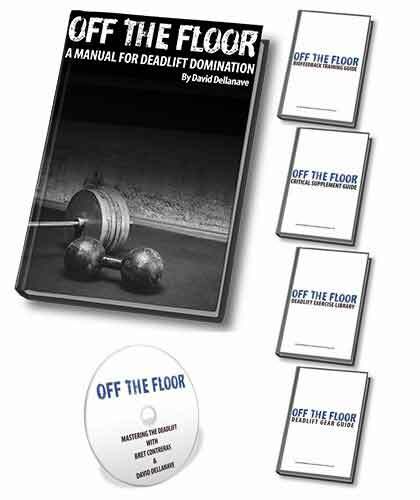 One thing I want to point out that is new since the very first release of Off The Floor in 2013: This book now includes 3 entirely new 8 to 12-week programs for a total of FOUR complete programs for beginner, intermediate, and advanced lifters as well as the original Off The Floor program which has put tens of thousands of pounds on the deadlifts of lifters in 2014. That's right, you get four complete programs in one. Simply because I want you to have the best information you can possibly have, you have the opportunity to pick up the 6-component system valued at $870+ for an investment of only $99. 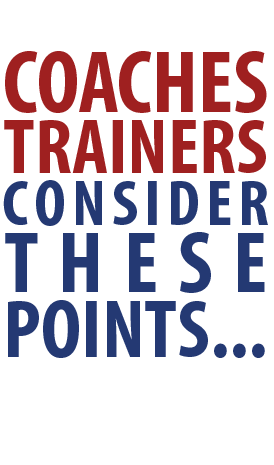 Now imagine if you wanted to work with a coach just twice per week, for the same 12-week period that the Off The Floor training program outlines — at a minimum of $75 per hour, you’d be spending $1800 in training alone. That’s more than twenty-five times the price for mediocre coaching, and probably mediocre results. On the other hand, for a one-time investment of $49 – way less than it would cost you for a single training session with me — you can get your hands on this highly prized, hard-to-find information, all assembled for you in one place. What’s more, you’re going to get a complete 12-week training program designed by one of the premier deadlifting experts around, who just so happens to be a world record holder. There’s no exercise on earth that packs on muscle to your shoulders, back, legs and arms like the deadlift. By increasing your deadlift with the Biofeedback system, you will put on muscle faster than you ever thought possible. When you add 30, 50 or 100+ pounds to your deadlift, you will instantly increase the numbers on your other lifts. The deadlift is the foundation for almost every major strength or strongman exercise. What can you accomplish without a strong foundation to build on? The deadlift is a foundation for LIFE – of all the exercises you could do, it’s the one that will have the most carry-over to everyday situations. 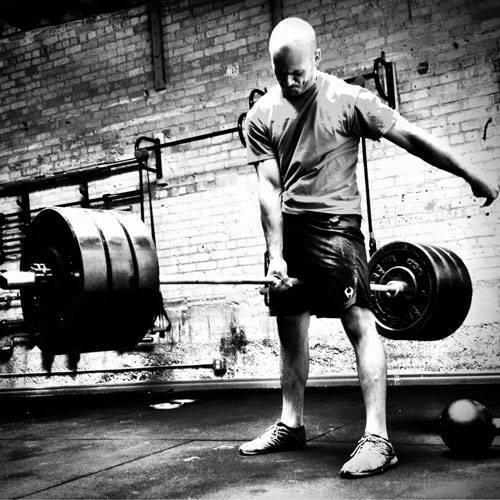 Every time you pick something off the ground, you’re doing a deadlift. Want to outgrow your current clothes because you’ve put on so much muscle? The deadlift is the quickest way to massive mass gains. The very best at every sport don’t follow some prewritten template program. They follow their intuition. In other words they apply their own Biofeedback while others are still glued to their Excel spreadsheets doing cookie-cutter programs. You’ll instantly know how to find the right deadlift variation for you – even when it changes! You will INSTANTLY be able to get your clients better results. They will get stronger more quickly and they’ll also get RID of back and hip pain faster than you ever thought possible. You’ll learn the exact strategy I use to increase the deadlifts of advanced lifters and stronger athletes. Most stuff will work for beginners, but I use entirely different techniques for increasing the deadlifts of my advanced clients. Let’s face it, people can get bored doing the same things over and over again. Stave off boredom by mixing it up. It’s only a matter of time before you hurt a client if you’re putting them in positions without considering how their body reacts to it – which is exactly what I will show you with regard to the deadlift in the Biofeedback Training system. In the Biofeedback section, you’ll discover how to program the PERFECT workout for your clients each and every time they hit the gym. This means more clients for you and more money for your business. Not only will you improve your clients' deadlifts – but I guarantee I can add 20 to 30 pounds onto your deadlift, even if you’re already pulling 400 to 500 pounds. If you don't want to get stronger, and you don't want to be an impressive deadlifter, and you don't want to pack on muscle then by all means do not buy Off The Floor. But if any of those things arent't true then you can't afford not to make the small investment. For less than half the cost of a single coaching session, you’re getting over 500 dollars of valuable content that is going to skyrocket your gains. For $49 you’re getting everything I’ve toiled for years to learn about the deadlift handed to you on a silver platter. All you have to do is take action. P.S. For $99 you are getting not one but FOUR done-for-you deadlift programs that will put 30, 50, or — if you're like I was — even 200 pounds on your deadlift while also packing muscle on your frame. 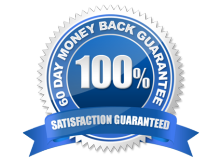 You’re also backed by my 100 percent money-back guarantee, so you literally have nothing to lose and everything to gain.